The design of the new prototype recycling centre incorporates the traditional metal roof design, along with a hybrid specification of Soprema Flag TPO waterproofing membrane and an Optigreen Extensive green roof system. The Flag TPO membrane is the only TPO on the market with an A+ BREEAM rating, ensuring that the environmental impact of the new recycling centre project is kept to a minimum. 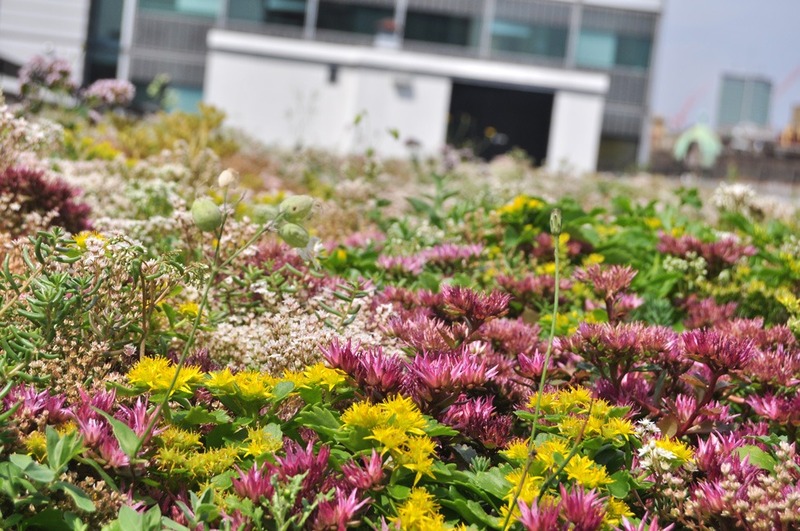 The extensive green roof will also provide multiple environmental benefits such as reducing storm water run off, biodiversity promotion, a natural habitat for wildlife, additional thermal insulation and also compensation of the natural footprint of the building. TR Freeman’s experienced operatives installed the waterproofing and green roof system with no complications. The project was completed to an exceptional standard within the set time frame and within the budget defined by the local authority. East Cambridge Recycling Centre is an example of exemplary workmanship and project management; working in partnership with the Architect, Wilmott Dixon, the Manufacturer and other trades on site to ensure the project’s success.